Upcoming Ballad Tutorials - Cast Your Votes Now! Here’s our list of requested jazz ballads to cover over 2019. Each of us gets 5 votes, and when the tune has been covered, we can change our vote to something else, so that we ensure that we are covering the most in-demand tunes. I will post the published lesson pages directly in this thread, so that all we need to do is scroll down to find the tutorial. I’ve already cast my votes, make sure you cast yours too! We can also post specific versions of the tunes we like below. I will do this with all of the tunes that I’m arranging. That way, we can create tutorials in a specific style of performance if desired. Jazz Standards - Vote Now! @Michael_J_Albanese - I’m looking forward to doing your request on “When Sunny Get’s Blue”. I’ve mentioned in another thread that every jazz standard I do from now on will be 2 parts, the first will be R-3-7 arrangement, and then the second lesson will be a full arrangement. There’s tonnes of 25 progressions in the form so the R-3-7 arrangement will be a really nice study for our beginner students. This will help beef up the beginner section of our syllabus, and it’s also nice to show how to arrange the basic skeleton of the harmony, and then go a little ‘off road’ in creating a nice solo arrangement. 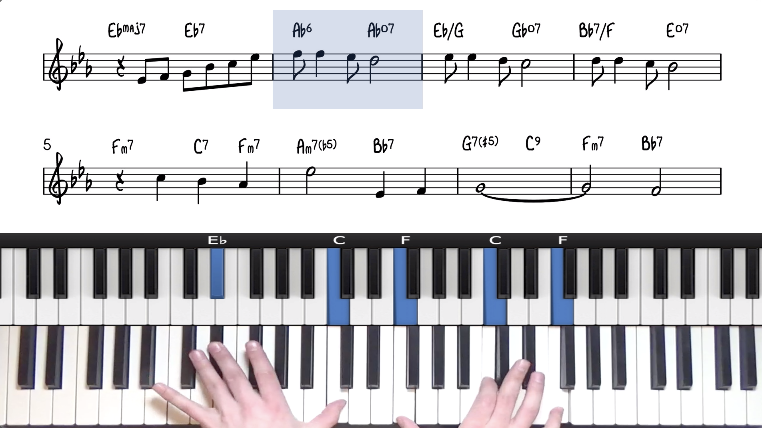 Let’s cover it in the original key of F, and that will be perfect to play around with some of the F Blues things we cover in our blues course. I’ve also been working on F Blues a lot recently so it will be nice to add some of the material in context of a 32 bar form. @Michael_J_Albanese - Listen to his “Q&A” approach where he states the melody and then comes in with a subtle but effective response… reminds me of @LoriNelson’s beautiful rendition of “Laura” here. Also listen to all those beautiful inner voices that George Shearing uses… Sublime! This is my favourite version I’ve listened to! Finally, always get a strong vocal version. I love this tune, I look forward to exploring it more. Yep I agree… brilliant suggestion from Micheal with this number. Please also do a little chapter on quartal voicings/rootless LH… I am guilty of learning the complex arrangements first, then I have a difficult time learning the comping… I’m trying to reverse my process now. Those basics are not just for beginners! I enjoy the jazzy cocktail sound in this version of Stars Fell On Alabama. This was beautiful to listen to on a Sunday afternoon. Ruby My Dear performed by Barry Harris. I agree that the drilling the rootless voicings through every standard is a super important exercise. It helps to visualise those extensions and alterations in context. The quartal ones can be a little harder - much more of a late-intermediate/advanced topic. I feel that for a beginner, stacking 4ths could be a little overwhelming, but leave it with me, I’ll have a play around and see if i can find a format that is accessible without being overwhelming. I completely agree that it’s important. I’ll find a way - perhaps it would fit in the 2nd tutorial with full arrangement. Jovino does that with some of his jazz standard tutorials, he says “first let’s accompany the tune” , and then he plays again with the melody… an intriguing approach. I must listen to this tune more to familiarise myself with it. Nice… Barry Harris is always a joy listen to. He’s been a big inspiration for myself. I love his “Q&A” approach in that recording. Very tasteful. He will listen to you play anything you like, and give you his feedback. Or you can just sit in the audience, and listen to others play, and listen to his wisdom and feedback. Sadly, he’s one of the last true ‘cats’ to still be with us. A true icon and giant in the jazz world. Completely understand that many folks will want to be able to comp to either accompany a singer (or themselves) or play in a group. While showing how to do that, I still hope you will be able to provide instruction on how to play those beautiful complete solo arrangements. I’ve been told many times not to change the format of my jazz standard tutorials so I agree let’s keep it consistent. 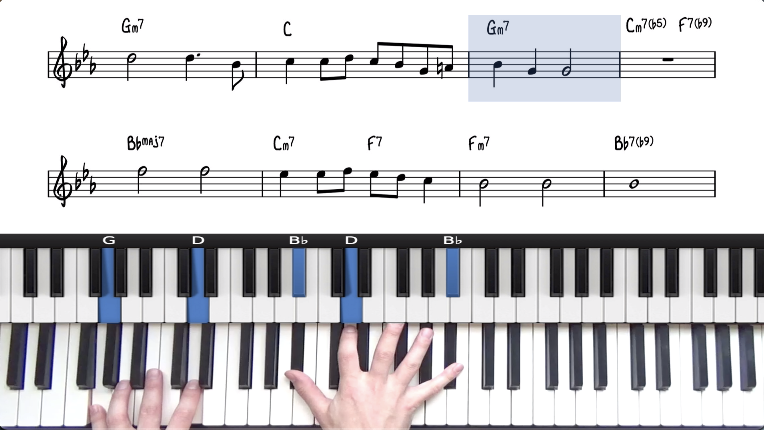 The idea with the R-3-7 arrangement (part 1) is that it gives that extra step for our early beginner students, who then have the foundations to progress onto the the ‘complete solo arrangement’ (part 2) if they desire to challenge themselves. The ‘part 2’ then follows the usual format of my jazz standard lessons. "Just Friends" is a great tune to improve your understanding of the 251 progression and the voice leading of b7ths dropping to 3rds. In this lesson we will explore the interesting colours & textures that can be accessed over dominant chords using upper structure triads. I think this format works nicely. 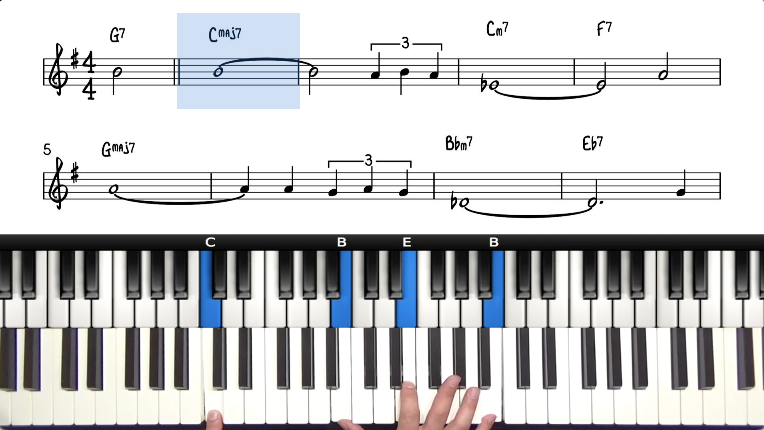 For the left hand voicing, we can run through those quickly at the start of part 2. However for quartal comping voicings, this may be tricky to deliver whilst being mindful of excessive lesson length. Yes, I find your current format to be very conducive to learning a piece and would hate to see it change too much! I think the two part versions are good. Even though my goal is to always play the advanced solo arrangement, I find the beginner version very useful as it helps to learn how to more readily play simpler versions of a tune as you flip through a fake book. Thanks for all you do! I am starting to enjoy piano more than I ever thought possible. I also wanted to support the two-part tutorials (and there is a whole number of them in PG already) for reasons given: the best way to learn from simple to more complex. All of these tunes will be fantastic…some really great choices! I have finished arranging “Someone To Watch Over Me” - the arrangement has come together beautifully. 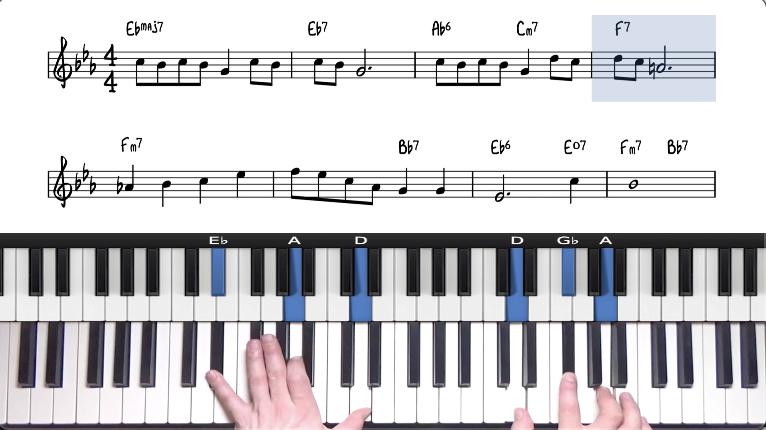 There are 2 tutorials for the tune, one simplified arrangement, and a more challenging one with left hand stride, block chords, and other ornamentation/decoration. The form is a little tricky (see iRealPro chart below) and so in the beginner arrangement I have simplified it the best I could. There is also a 24 bar intro which I’ve included as it sets a lovely tone for the the tune. 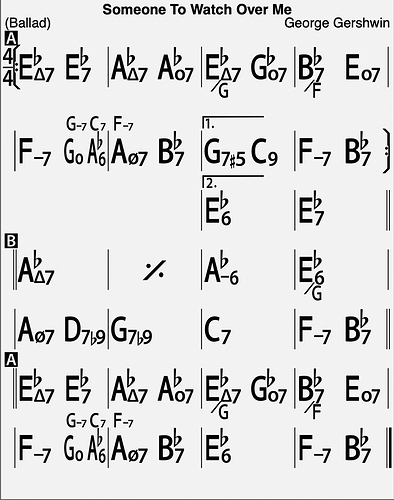 However, this additional 24 bars makes the arrangement much longer than the usual 32 bar form so be prepared! I wanted to make sure that all who voted for it can play it, and so the 2 tutorials should ensure that it is accessible to all levels and abilities. The first lessons on “Someone To Watch Over Me” have been completed. These 2 lessons are advanced-level, and I am creating a beginner-focused version too which will be ready soon. 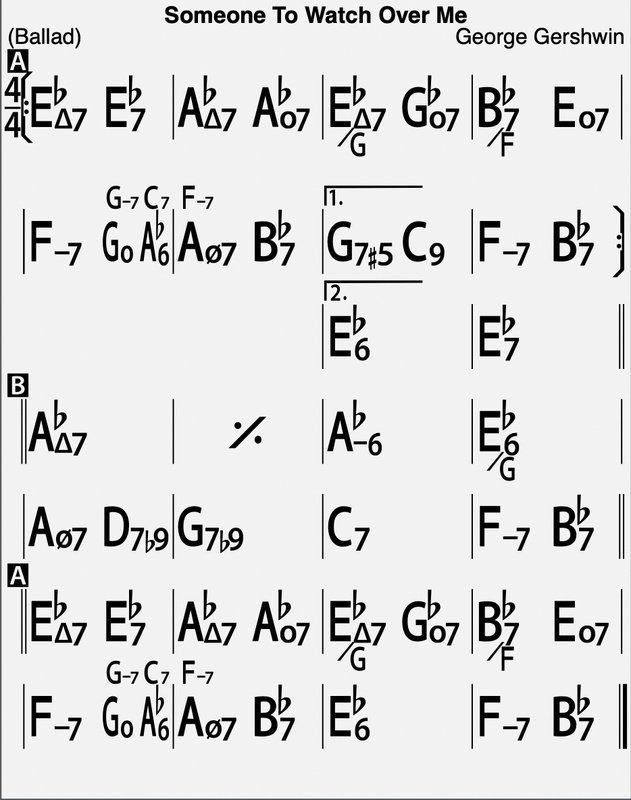 It’s proving challenging to simplify this tune for a beginner tutorial but I’m working on it and I will get there! Spend some time to work these chords and progressions, and once you feel comfortable you can move onto the main 32 bar form of the tune. The tune follows a standard 32 bar AABA form and there is also a 24 bar introduction which we are going to include in the arrangement. This tune follows a standard 32 bar AABA form and there is also a 24 bar introduction which we are going to include in the arrangement. I’ve tried my very best to make it as accessible as possible so we can all play this beautiful composition. 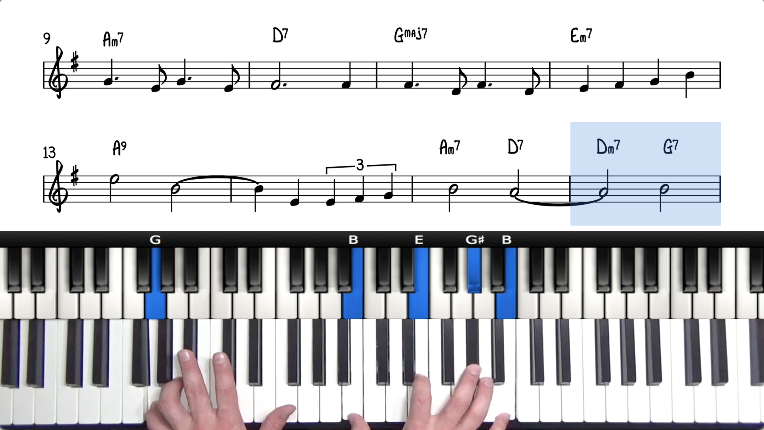 The above lesson has been added to our Jazz Piano Foundations Course. I feel that the arrangement illustrates the importance of knowing our triad and 7th chord inversions which is now a nice addition to the course. I don’t set all these tedious exercises for no reason! … they will give you a solid foundation on which you can build so stick with them. If anyone has feedback on my recent beginner-focused lessons, let me know as I’m always looking to improve them. There are some interesting harmonic principles in this tune which I want to explain in detail. This warrants its own lesson which will be added to our course on Diminished Harmony.